It’s amazing how some people can survive in the most hopeless of situations, whether they’re trapped in the desert, stranded in a remote wilderness, or in this case left to float in the middle of the open ocean. In 1983, Tami Oldham did exactly that, and to this day her story of surviving her ill-fated boat journey from Tahiti to San Diego is one that inspires and also haunts people for the sheer toll it took on her. Her story is now told on-screen in director Baltasar Kormákur’s Adrift, and much like his previous English-language film Everest it doesn’t shy away from the more harrowing elements of this true story, but it also manages to find the warm humanity at the very centre of it all. The film adopts a non-linear narrative, as we are first introduced to Tami (Shailene Woodley) when she wakes up in the aftermath of the storm that begins her ordeal, before cutting back to five months prior when she first arrives in Tahiti and meets charming British sailor Richard Sharp (Sam Claflin). It regularly cuts back and forth from there, as we see the development of Tami and Richard’s relationship, culminating in them setting off on their fateful voyage together and sailing right into the deadly storm itself, and then how Tami tries to fix the damaged vessel as best as she can, while also coming across a still-alive Richard who has suffered a broken leg and ribs in the storm, leading to her trying to be strong so she can save both of their lives. According to this movie’s trivia, Kormákur largely forewent filming in water tanks or using visual effects and actually brought his crew out to the middle of the ocean, about two hours away from land, for shooting days that would last about 12 hours and led to so many cast and crew members getting severe seasickness. Filming at sea is a pretty daunting task in and of itself, especially when most of your film is primarily set there, so you have to admire the cojones on this guy to really push himself and his crew to film in these uneasy conditions, and make it look incredibly stunning at the same time. It is a very well-made film, with strong direction on Kormákur’s part, and stunning ocean cinematography on Robert Richardson’s; both of them really make this harrowing tale burst to life on the screen, especially when you know that they really went all-out in making it look as authentic and oddly beautiful as they could. It also contains some truly fantastic acting, with Shailene Woodley truly giving one of the most fearless and emotional performances she has yet given in her already-impressive career. When you see some of the things she has to do or react to, particularly when she’s mostly by herself on a damaged boat and surrounded by nothing but miles of water, you can only imagine some of the dark places she had to go to in order to give a performance this raw and intense. It’s the kind of performance that will break your heart in all the right places, and she easily carries this movie with great ease, which is handy because for a lot of it she’s the only one on screen. That’s not to rule out Sam Claflin either, as he delivers a pretty impressive performance here too; his character is very charming and likeable, which are both traits that the actor has more or less nailed down by this point, but he still manages to find a way to make this character seem fresh and interesting, and even when he is largely incapacitated due to the storm, he’s still a warm presence that gives great support to his on-screen counterpart. Talking of which, Woodley and Claflin’s chemistry here is impeccable, and right away you can really believe that this is a couple who would end up together, because both of them work off of each other phenomenally well and are genuinely sweet towards each other. Their chemistry is so good, in fact, that it makes you wonder if other filmmakers will pick up on that and cast them together for a few more movies, not unlike Ryan Gosling and Emma Stone after they appeared in Crazy Stupid Love and ended up with each other again in La La Land. It would be welcomed, and at the very least we would be able to see both of them working off each other again, outside of just this movie. The plot is certainly one that mirrors a lot of other survival-at-sea movies, and contains a handful of familiar tropes that aren’t difficult to spot, but it’s executed so well and the performances so natural and likeable that you’re sucked into the story and genuinely wondering how it’s all going to work out for them, even if you already know the story going in. Whilst I’m on that subject, there is a reveal near the end that will probably either make or break the film for you, because you’ll either be emotionally invested in its deeper meaning, or scoffing at how it really went in that direction. If you’re already familiar with Tami Oldham’s story then you’ll probably have already figured out what that reveal is, but of course if you’re not I won’t say anything here; just know that it’s played out very well and didn’t bother me personally, though I can understand why it would annoy others. Either way, expect that to either make the film worth it, or not in the slightest. For what could have so easily been a cheap Nicholas Sparks-type romance with a sprinkle of disaster movie thrown in there, Adrift is actually a movie that’s fuelled with such passionate ambition by both the filmmakers and the cast, and is a very emotional and harrowing story told with such grace and love that it’s hard not to resist. 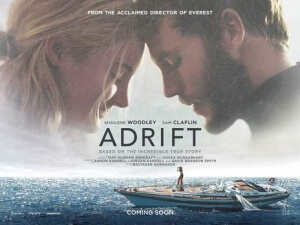 Adrift is a strong and emotional tale of survival at sea, passionately well-made by an ambitious director, and phenomenally acted by its two leads, especially Shailene Woodley, which are enough to forgive it for a familiar story and make-or-break twist ending.